How cute is this little guy? For the first time in 35 years, scientists have discovered a new carnivorous mammal in the Americas. The two-pound Olinguito looks like a tiny red-furred cross between a raccoon and a house cat. It lives in the trees of the Andean cloud forest in Ecuador and Colombia, where it is active at night. 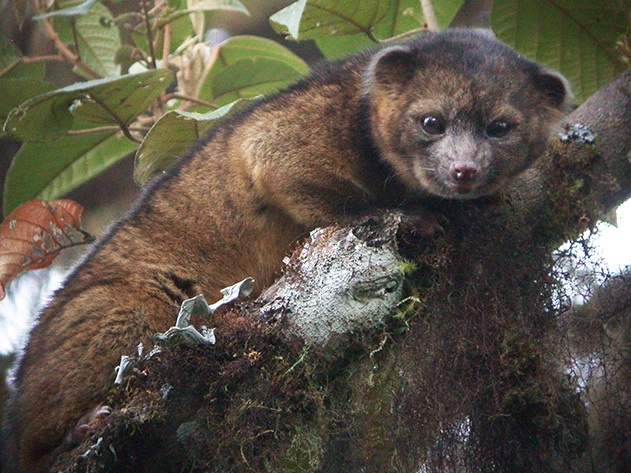 Researchers have found more than two dozen examples of the Olinguito that are in private collections, but were incorrectly labeled. There is a report one was even in a U.S. zoo in captivity in the 1960s, where zookeepers were mystified by why it refused to breed with its peers (they were the wrong species, silly people!). A member of the raccoon family, the Olinguito’s more commonly known cousin is the Olingo, which is slightly larger and a different color. The existence of the Olinguito as a separate species was proven through anatomical and DNA evidence. The last discovery of a carnivorous mammal on the plant was in 2010 on Madagascar. You can read more about the Olinguito on the Smithsonian magazine website. All the banana slug fans at UC-Santa Cruz may blush with envy when they see their newest known relative. This species was recently discovered on an Australian mountain. The slugs make their home among red Eucalyptus leaves on the ground, which might explain their vivid coloring. The bright pink that makes them stand out among their yellow-toned banana slug brothers, might actually be a form of camouflage in their environment. The slugs can grow to be 8 inches long! Read more about it on the National Geographic website. Madagascar is an island nation in the Indian Ocean off the southeastern coast of Africa. The main island, which is also called Madagascar, is the fourth-largest island in the world. Now, scientists have found and identified another animal on Madagascar. An mongoose-like creature has been discovered living in the in the country’s wetlands. It is a cat-sized carnivore with wicked-looking teeth. Because it was discovered by researchers from the Durrell Wildlife Conservation Trust, founded by naturalist and author Gerald Durrell, the new animal has been named Salanoia durrelli, or the Durrell’s vontsira. That the vontsira would be found on Madagascar is unsurprising. While most new land-dwelling species are small and easily overlooked, tropical jungles, like those on Madagascar, contain Earth’s last few unexplored areas. Unfortunately, the wetland home of the Durrell’s vontsira is threatened by agricultural expansion. Conservationists say that protection is urgently needed for the vontsira to survive. 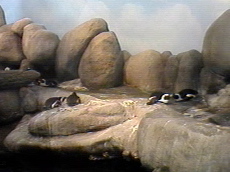 Kit is an otter that was stranded as a pup. She now lives at the Monterey Bay Aquarium. For several years now, dead otters have been puzzling marine biologists. The mystery began in 2007 when nearly a dozen otters mysteriously died in Monterey Bay. Their carcasses were taken to the California Department of Fish and Game laboratory in Santa Cruz for analysis. It turns out the otters are being poisoned by a microbe, a type of cyanobacteria that appears to be on an upsurge in warmer, polluted waters around the world. Cyanobacteria are commonly called blue-green algae, blue-green bacteria, and Cyanophyta. They are a type of algae that get their energy from photosynthesis, and their name from their vivid color – cyan. This particular cyanobacteria is called Microcystis, and it’s not new or rare. It’s an ancient ancestor of modern-day bacteria and algae, and it dominated the planet more than 2.5 billion years ago. Scientists have found that strains of it are reappearing in stagnant water polluted with nitrogen from agriculture, and waste from human activities. It’s been found in water in every country in the world. Microcystis is absorbed into the tissues of shellfish in contaminated water. There it remains, becoming more than 100 times more concentrated that it is in the surrounding water. Otters eat the shellfish and get sick and die. The otter population off the California coast has dropped in recent years, which means that adult otters are dying faster than baby otters are being born. California’s otters were hunted, almost to extinction, by fur traders in the early part of the 19th century. Otter fur had long been prized by Native Americans and other cultures for it’s incredible warmth and softness. Otter fur soon became in demand as a luxury item in many parts of the world and otters were hunted until they were almost entirely wiped out. The rebound of the otter population on the North Coast has been an ecological success. However, they are still an endangered species and are always subject to threats such as sharks, watercraft, parasites, and food shortages. Right now, there are about 2,700 otters living on the California coast. The discovery that the algae is killing otters was made by Melissa Miller, a state wildlife veterinarian who has been tracking the mysterious deaths like a detective. (Visit her website here.) You can read more about how she made this important discovery in this fascinating article in the Los Angles Times.